Dining with the little ones in tow can be tough sometimes. We spend a lot of time trying to shape our kids into calm little humans, but sometimes, you just want to relax and let them run around and play. Lucky for us, Austin has a lot to offer when it comes to dining out with children. 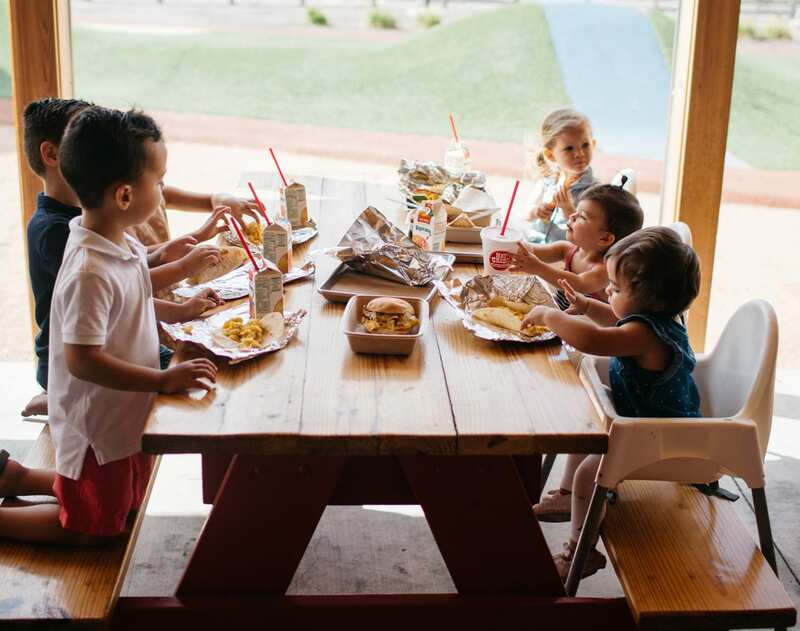 –> Hat Creek Burger Company is the ultimate family friendly burger joint with unique play yards at all of their locations. With great menu options such as burgers, chicken, sweet potato fries, milkshakes and even breakfast tacos and pancakes, there’s something appealing to taste buds of all ages. But the best part is letting the kids play in enclosed areas while you can sit back with a beer and relax with friends. 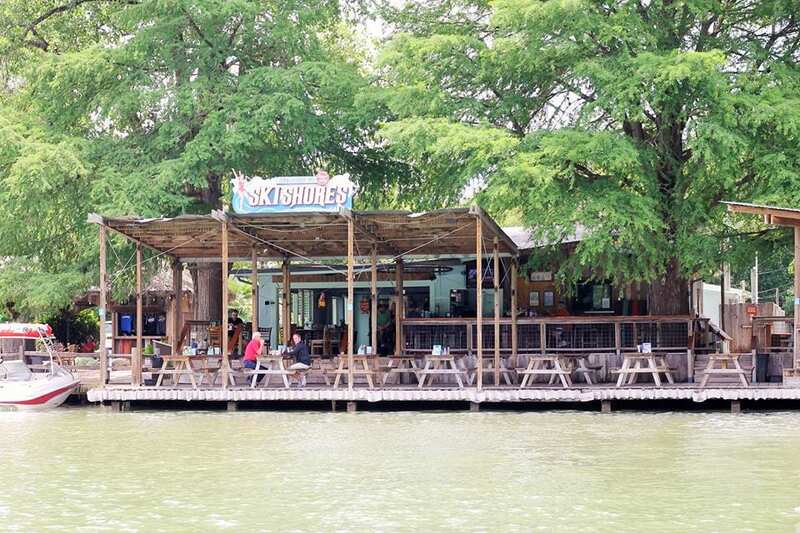 Photo from Hat Creek Burger Co.
A gem on Lake Austin! Down the long and windy City Park Rd., lies this lakeside eatery with mostly outdoor seating and tons of space for play. 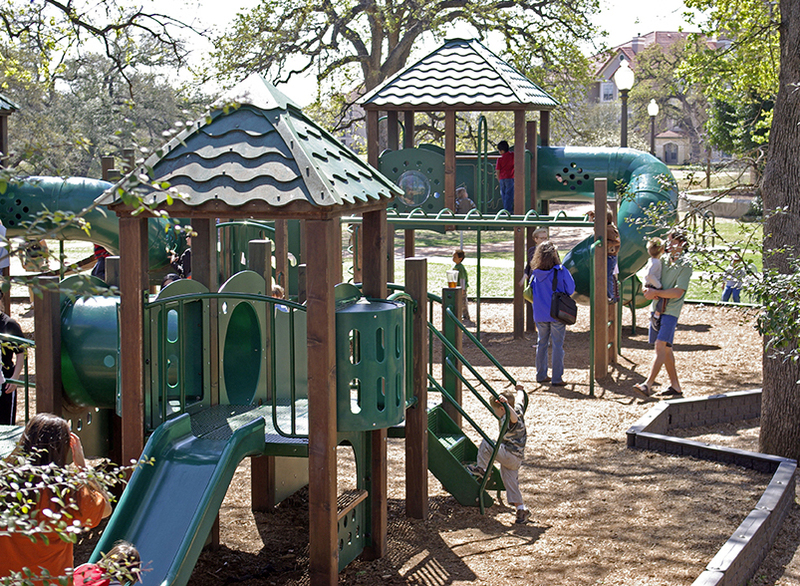 They boast a gated playscape, a sandy zone, and kids can enjoy watching turtles and fish in the lake. Ski Shores also has an indoor game room with air hockey and several classic video games. Head out on special Fridays for Family Movie Night with a projector style kid-friendly film screening outside. They show at dusk, check their Facebook page for details. The menu includes burgers, wraps, fries & onion rings, and you can finish with shaved ice. 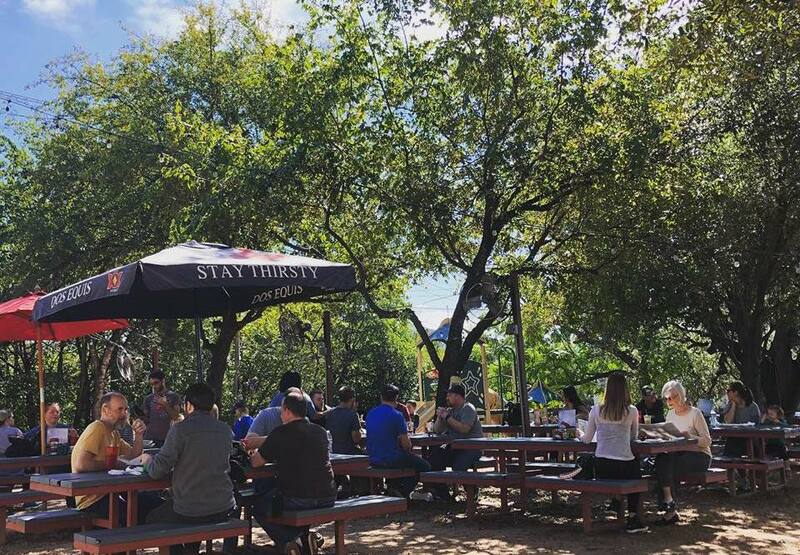 Phil’s is one of Austin’s dreamy spots for burgers, playtime, and fun. It also helps that Phil’s is paired next to Amy’s Ice Creams at all three of their locations (Burnet Rd., South Lamar, and North Austin on 183). The menu offers up kid-friendly basics like burgers & fries, corn dogs, chicken tenders, etc. And take note that they have Parents’ Recess, which is basically happy hour Monday – Friday from 3-7 p.m. with discounted beer and wine specials. But the playground areas at each location are the big draw for happy families. Kids can go nuts on their colorful playscapes while you enjoy some comfort food. Just don’t forget to save room for ice cream! This is a great choice for relaxing in a fun, outdoor setting. A diverse menu with items from Asian salmon salad to fish tacos, soups, pasta, and more offers something good and good for you, too. With live music, a playscape and a duck pond, your kids should have a great time while you relax and enjoy lunch or dinner with the whole family. It’s a bonus that you can pop into the Market to pick up some groceries while you’re there, too. Those of us north of the river had been anxiously awaiting the opening of beloved Home Slice Pizza’s second location, and boy did it not disappoint! The outdoor patio with children’s play area is equipped with a unique space to run off some wiggles and play some games of corn hole with mom and dad. It’s super cute! Of course, like the South location, kids are offered a big ball of dough to play with before the meal to keep those little hands busy at the table. We also love that this Home Slice has a cool full bar and also features menu items like square Sicilian-style pie and Buffalo chicken wings. 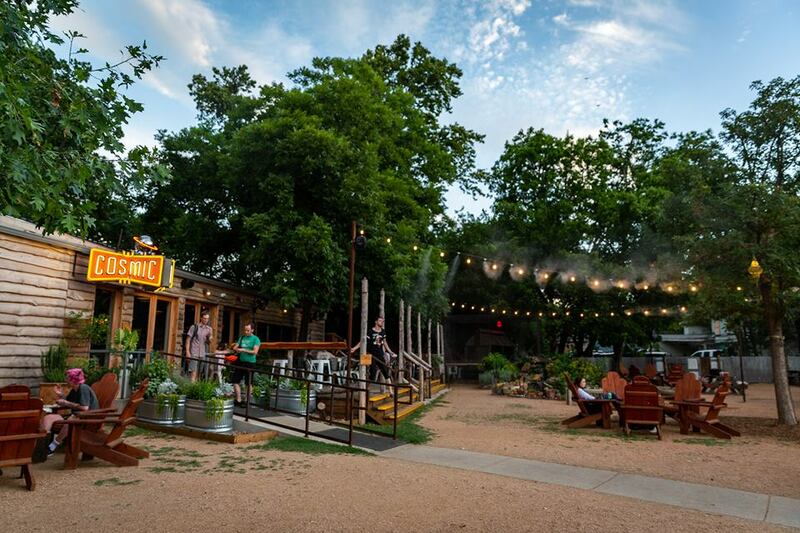 This delightful South Austin spot has a terrific patio vibe that includes a sweet little pond, chicken coop, and garden. Part coffee shop, part bar, this is a kid and dog-friendly venue for easy hangs. Here you’ll also find food trucks Leroy and Lewis Barbecue, Tommy Want Wingy, and Pueblo Viejo. This charming North/Central Austin neighborhood cafe makes you feel like you’re entering a friend’s home, where you can explore its many rooms, back patio or front porch to find a cozy spot to settle into. There is also a room designed for families, equipped with a train table and a selection of books, toys and board games. And bonus, there is a pirate ship playground in the back yard! Brentwood Social House offers a big variety of community events, so keep track of their calendar for activities. On the scene in Austin since 1976, Waterloo Ice House offers up a huge menu of salads, burgers, sandwiches, & Tex-Mex options. They have three locations where the kids can play outdoors (360/N. Capital of TX Hwy, Southpark Meadows, Slaughter Lane & Escarpment Blvd.). Kids can enjoy a playscape, sandpit, outdoor and indoor seating with plenty of shaded tables. Even the pickiest little eaters can find something delicious to enjoy at Kerbey Lane Cafe. 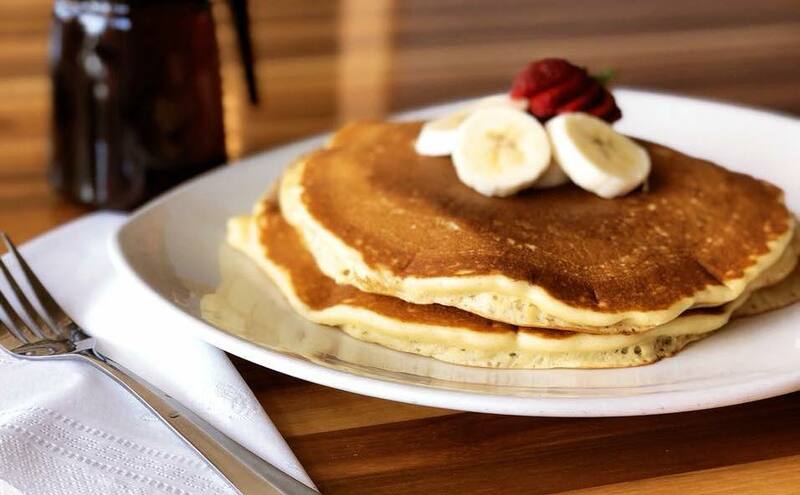 This kid-approved Austin classic has 8 area locations, you can stop into any Kerbey Lane Cafe for huge pancakes in a great variety of flavors, even with vegan options. 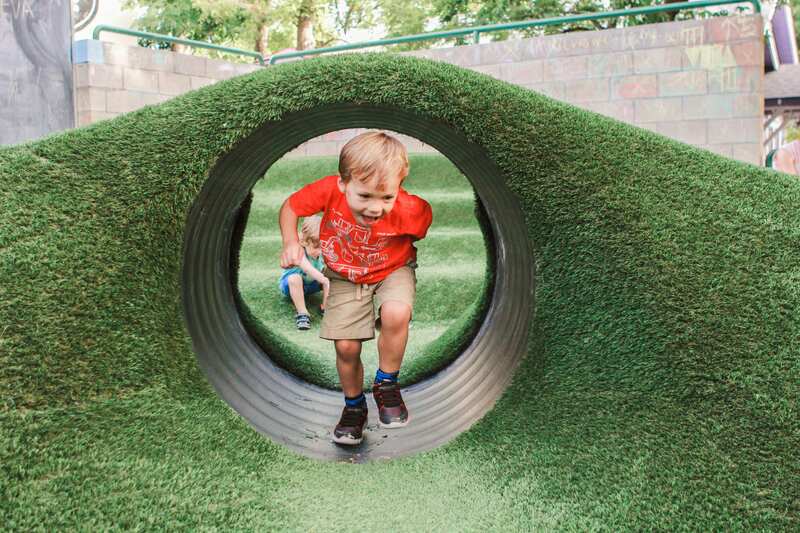 And take note that there are little playscapes at both the Kerbey Lane in Westlake and in Round Rock, and the Mueller location is just a short distance to the Mueller Lake Park. Also note that on Tuesdays, kids ages 12 & under eat free all day with the purchase of an adult entrée. Not just one restaurant, the Triangle Park is surrounded by many restaurants serving up a wide variety of cuisines including Maudie’s Tex-Mex, Mama Fu’s Asian House, Hopdoddy’s Burger Bar, and Mandola’s Italian Market. 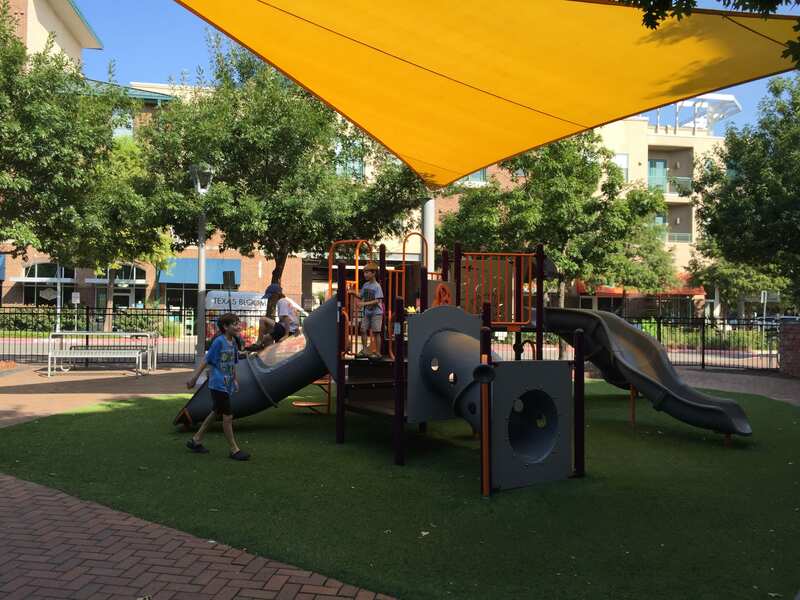 After enjoying your meal, head over to the Park to let little ones play, then finish with fro-yo at Yogurt Planet. No matter what you’re in the mood for, The Triangle has got you covered. What’s your favorite place for dining out with the kids? Feel free to let us know in the comments below! I love Contigo. But it is not a place for kids, unless your kids like foody (read "weird") food and the company of adults. The sandy area is not a sandbox, and if you let your kids run around kicking up dirt just because they happen to be outside, you give the rest of us parents a bad rep. My husband and I go to Contigo on our date nights--when we aren't worrying about our kids. It's not a place to avoid with your children, but it is not in the same category as the other restaurants mentioned in the article. Thanks for the input, I added a little disclaimer into the Contigo paragraph. I really just wanted to add something with a bit more choices for adults, the other joints are so burger & fries and not every family feeds their kids those items. I've seen some kids having a ball there, but it's not for everyone. We took kids here, and it was the PERFECT venue. Adults got great food &drinks, and the kids played in the sand. Not many food choices for kids, but they ate grilled cheese, fries, and we brought applesauce. One thing I like about Contigo is that the establishment and clientele there are accepting of kids. I think that makes a big difference in which place we go. It's definitely higher end food for your typical restaurant but that is what makes is special for us. What about Hat Creek Burgers at Bee Caves Rd and 360? It has a great play area. It also has great food. Chicken nuggets and stuff for the kids. Great burgers and beer for the grown ups. And a great outdoor seating area with an awesome deck. And affordable!! Thanks for recommending another place! We will be updating this list in the near future and will definitely be adding Hat Creek. Thanks for reading. The Hat Creek on Burnet Road looks like it has a new playscape, as well. Thank you so much for this GREAT list. So far we've visited Freddie's Place and Waterloo Icehouse. We hope to check out Nutty Brown Cafe and Austin Pizza. We are on vacation and checked out Freddie's out first night since it is not far from our hotel. If I lived here I swear I'd never cook again. We have 3 children 5 and under and eating out is not something we do often, but we felt so welcome at Freddie's Place. It got chilly when the sun went down, but the staff got out the table heaters and we were cozy. The kids roasted marshmallows and made smores after devouring their waffles. The hubby and I enjoyed watching the game on one of the many large outdoor tv's. And the food was great too. I had the portobello sandwich with sweet potato fries - yum! Really folks, you can't pass up an opportunity to eat here. We will be going again before we leave. As for Waterloo Icehouse, the staff was extremely friendly, the playscape was wonderful, but the food was only ok. Most of what we got was rather bland, but the kids menu was great! Our kids loved the mac&cheese. I'd go here again just to have drinks and conversation with my husband and to watch the kids play, but not for the food. Thanks again for this list!!! Thanks for this list! We're always on the hunt for a family friendly spot. Two that didn't make the list but that we love..even including the drive out are Craigo's Pizza in Lakeway and our ALL time fave- Verde's Mexican Parilla out off Hamilton Pool Road. We visited Germany/Austria recently. I was amazed how EVERY restaurant we visited had a kid friendly space included. I'm certain this was because we were seeking these types of places out, but they seemed so much more common. Looking forward to getting something cool in Northwest Austin, we'll be watching for the next list! I love heading to Phil's Icehouse off Burnet and S. Lamar and I heard they are now building one 183 and Anderson area! Reunion Grill in Cedar Park has a nice playscape as well. I haven't been there yet but looks family friendly and has a great menu. They also have live music. Reunion Grille was great for families, but it closed down. They are planning on reopening soon, it will have a new name and some new features. I think the playscapes will be staying for sure. The new Maudie's at the Triangle has a playscape right off the patio that's fenced off from the street. My kids enjoyed the playground and I appreciated the turf grass for the falls they took. Midway Food Court on 360 deserves mention. Great food trailers, playground, and lots of tables. I know a bit out of the way. However, if you need some home-cooked food and great country atmosphere. Great Place. The food is great, has a playscape for the kids, washer pits, and live music. They do have beer and wine only. We love Dahila Cafe in Liberty Hill. Check out the weekend band line up.. My son loves the dance floor and the tables outside by the band is ideal for a smaller child or toddler. Where is Mandola's Italian in Bee Cave and Arbor Trails? Both locations have excellent kids menus and wonderful free gelato. They also have great playscape areas that you can sit and eat so you can watch your tots at the same time. The Whole Foods Market on Lamar has a great play area up stairs with restrooms close by. Bonus points: you can get all kinds of delicious foods!! Please check out the Farmhouse Pizza place…….it's so wide open. We bring the soccer balls and the kids get dirty. Food is also pretty fantastic. Lonestar steak house in Cedar Park (i believe is hope avenue) has a playscape and it also has live music at night, i am not sure is only weekends or only special ocassuons but either way, we love that place. Another steak house with playscape is Salt Lick in Round Rock is right next to the Dell Diamond. County Line on the Lake - great BBQ & the kids can feed the turtles from the deck. Not super-cheap, but a good value as the portions are enormous. Docs backyard in sunset valley!!! I have a few more ideas to add to the list. 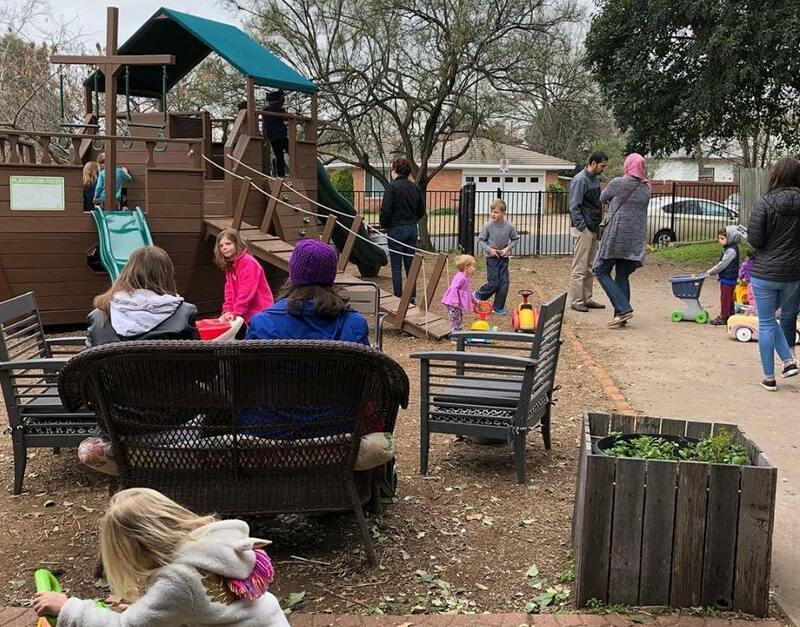 Mandola's in Arbor Trails has a playscape in the back, Doc's Backyard off Brodie Lane has a playscape and Flores Mexican Restaurant off William Cannnon near Mopac has an enclosed playscape. 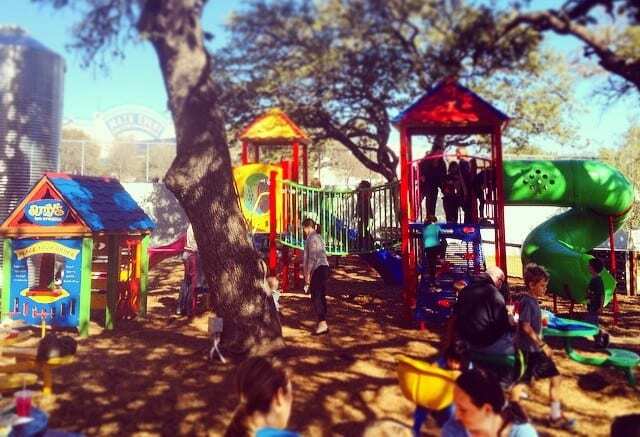 There is a great playscape right between Flores Mexican Restaurant and Highlights Gametime Grill off of FM 620. Stubbs Graceland Grocer on 290 and circle drive has 2 giant playscapes, outdoor bar, and stubbs. Treaty Oak Ranch is an awesome place to take the kids! Big fields and a playground, and a kid friendly menu. You should add to the list Las Flores on West William Canon Dr. Good food, drinks and a great fenced playground. Treaty Oak Brewing and Distilling has a great play area and acres for the kids to run. When you next update this list be sure to include Fresa's on S. 1st. It's got fantastic food for parents and kids alike and a gorgeous patio with plenty of space for the kids to run wild. This is a great list! We also LOVE Lucy's on the Lake out on 620. Big play area and tons of easy outdoor seating. The food is all really good (even salads) and they have great drinks. Rebel Pizza Bar at Anderson and Mopac is also good for kids. Their roof deck has lawn games and room to run around. Doc’s Backyard on Brodie is pretty awesome for both kids and adults!